The Onyx event will be Aug. 24. 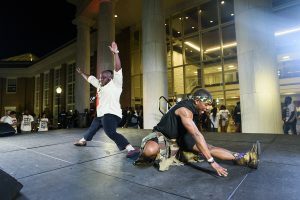 University Programs — part of Student Life — brings University of Alabama students together each year near the start of the academic semester with a series of events that promote unity and strength through friendship – the Week of Welcome. Here are some of this year’s activities. Some activities require tickets where noted. Ticketed events may offer waitlists. Saturday, Aug. 11: Mini Carnival at Ridgecrest South (Ferguson backup location if rain), 7 to 9 p.m.
Sunday, Aug. 12: Escape Room at All In Adventures, 4 to 6 p.m. For tickets, click here. Monday, Aug. 13: Tied With the Tide: Zumba at Ferguson Lawn, 8 to 9 p.m. For tickets, click here. Tuesday, Aug. 14: Tied with the Tide: Autobahn Indoor Speedway in Birmingham, noon to 6 p.m. University Programs will take students to Autobahn Indoor Speedway. Students will hear a brief history of Autobahn and driving safety rules. For tickets, click here. Wednesday, Aug. 15: Glow in the Dark Skating & Mini Golf at the Ferguson Ballroom, 7 to 9 p.m.
Thursday, Aug. 16: Spa Night at Tut, 7 to 10 p.m.
Friday, Aug, 17: Bowl So Hard at AMF Bama Lanes, 7:30 to 9:30 p.m. For tickets, click here. Sunday, Aug. 19: Tied With the Tide, Breakfast on the River at River Restaurant, 1650 Jack Warner Parkway, 9 a.m. to noon. A representative from the Counseling Center will come and speak to students about ways they can stay stress-free through the academic year. For tickets, click here. Sunday, Aug. 19: Silent Disco at the Ferg Ballroom, 7 to 10 p.m.
Monday, Aug. 20: Ripple Effect service event, starting at 8 a.m. Ripple Effect is an annual day of service during Week of Welcome that provides an opportunity for new and returning students to connect with the Tuscaloosa community. For details and to sign up, click here. Monday, Aug. 20: Yea, Alabama! Registration Party at the Ferguson Ballroom, 2 to 5 p.m. This program symbolizes one’s entrance into the social and academic community at UA and offers small group meetings on Aug. 21. For more information, click here. Monday, Aug. 20: Concert at Coleman Coliseum, 7 to 10 p.m. Details TBA. Tuesday, Aug. 21: Yea, Alabama! Welcome Party at the Quad, noon to 2 p.m. For details, click here. Tuesday, Aug. 21: T-Town Life Festival at the Quad, 4 to 6 p.m.; fun and food before the convocation and the Script A photo. For details, click here. Tuesday, Aug. 21: Convocation and Script A photo, Bryant-Denny Stadium, 6 to 8 p.m. Yea, Alabama! ends with a formal introduction into UA’s academic community with convocation, a pep rally featuring UA coaches and cheerleaders, and a freshman class picture taken on the field at Bryant-Denny Stadium. For details, click here. Wednesday, Aug. 22: Welcome Back Breakfast at the Ferguson Center Plaza, 7 to 9 a.m.
Wednesday, Aug. 22: Black Faculty and Staff Association Welcome Reception in 205 Gorgas Library, 4 to 6 p.m.
Thursday, Aug. 23: WOW Music Glow Run, 7 to 9 p.m. running from Cyber Hall. University Programs will partner with on-campus organizations to host a glow-in-the-dark 5K that features music lining the track. For tickets, click here. Friday, Aug. 24: ONYX at the Ferguson Center Patio, 7 to 11 p.m. The event will include exhibitions and performances from NPHC Greek organizations and on-campus dance organizations, as well as table information from minority-focused student organizations. Sunday, Aug. 26: WOW Amazing Race at the Quad, 4 to 6 p.m. Students will compete in teams to complete challenges in hopes of being crowned winners of the Amazing Race. Students participating in the event will be given various hints, clues and activities that will allow them to navigate around the campus. For tickets, click here. Tuesday, Aug. 28: WOW UpSurge at Trampoline Park, 7 to 10 p.m. Students will participate in various trampoline activities at UpSurge. For tickets, click here.